When two-year old Sienna Wilson suddenly developed a fever in the middle of the night the first thing her parents, Kate and David, suspected was malaria. When the doctor arrived in the morning he agreed. He began treating her accordingly. Hours later, unconscious and in a critical condition, Sienna was airlifted to a private hospital in Lusaka. Only then was she diagnosed with pneumonia. According to Dr Stefan Peterson, the leading expert on pneumonia for UNICEF, Sienna’s case is typical – lack of investment and the absence of any global initiatives, such as those seen for malaria or HIV, mean thousands of pneumonia cases are misdiagnosed and mistreated each year. In many of these cases the sufferer, usually a child, does not survive. A study by the University of Southampton recently found that between 2000 and 2015 pneumonia got only 3 per cent of the research funding dedicated to infectious diseases – which is “totally out of proportion to its role as a cause of death”. Around 300,000 children under five die each year from malaria, 500,000 from diarrhoea. The number of deaths from pneumonia, though, is more than these two combined: 900,000. “Pneumonia has replaced diarrhoea as the biggest killer of children,” says Professor Keith Klugman, director of the pneumonia program at the Gates Foundation. This is not due to an increase in pneumonia patients but a decrease in death from diarrhoeal disease in some parts of the world, thanks to vaccination programmes, low-cost treatment solutions and better sanitation. According to Professor Klugman now the same efforts need to be thrown at tackling deaths from pneumonia. Low-income countries are most affected by pneumonia: the illness is about three times more common than in developed countries. The first reason for this is that children in rich countries are vaccinated against pneumonia-causing bacteria pneumococcus. This is pricey, though. The vaccination in the United States, for example, requires four doses costing $200 each. Over the last few years, organisations like the Gates Foundation have worked to make the vaccine available in poorer countries at a lower cost: around $7 dollars per dose. Even at this price, however, for many countries with a high birth cohort – like India where 27m children are born each year – this has been unaffordable. Moreover, in the countries which have benefited from the reduced-price vaccine this financing system is coming to an end: most governments are now unable to pick up the cost. Children in wealthier countries are also, in general, less exposed to air pollution, and live in less cramped conditions, reducing their susceptibility and the risk of exposure. Most scientists, like Professor Klugman, agree pneumonia starts “with a viral respiratory tract infection”, otherwise known as a cold. In the majority of cases, people begin to get better after a few days or so. But some get worse: this usually means they have a secondary-bacterial pneumonia. “Most of us come into contact with pneumococcus (also called streptococcus pneumoniae) – the most common pneumonia-causing bacteria – quite often,” says Professor Klugman. It is only when someone is exposed to pneumococcus while their immune system is already weakened that their bodies are unable to fight it. Children in less developed countries are not only more exposed to the bacteria, but also, due to higher levels of malnutrition and the knock-on effect this has on their immune systems, more vulnerable to developing pneumonia. Deaths are equally much higher in low-income countries. Healthcare professionals lack access to good diagnostics, and even when pneumonia is correctly diagnosed – often belatedly – they have limited or no access to the expensive amoxicillin or, yet more costly, oxygen needed to treat it. This matters in countries where many babies are malnourished. The lack of oxygen and increased carbon dioxide in the lungs causes the child to breathe faster and faster to keep oxygen coming in. Unlike well-fed babies, malnourished ones simply do not have the energy stores to keep this up for long. A lot can be done to prevent and treat pneumonia in these settings, though, and much of it cheaply. Dr Peterson estimates that exclusive breast feeding for the first six months would prevent around a quarter of pneumonia cases. Over time, we build up antibodies to fight pneumonia pathogens like pneumococcus, which means by the time most women have children they are pretty much immune. In the last weeks of pregnancy, antibodies are transferred to the unborn baby. In the few months following birth, breast milk then gives additional protection. After around six months, however, this protection is lost – and for non-breast-fed babies it is even earlier. Dr Peterson also argues that if newly developed, cheaper vaccines could be scaled up overall deaths could be reduced by between 2 million and 3 million a year. This, however, would require a surge of investment into research and roll-out programmes. The will from the international community to initiate this, says Dr Peterson, “is lacking”. In part, he believes, this is because its worst effects are limited to the poorest, and secondly, because, unlike other diseases such as malaria, for which donor governments happily give money to buys mosquito nets, fighting pneumonia is complex. “It requires reducing pollution and scaling up immunisation – both huge tasks – and that’s just the prevention side. Then there’s the curative side,” he says. While the investment required remains absent, doctors and healthcare workers on the front line of the fight against pneumonia are coming up with their own low-cost means to try to save lives. 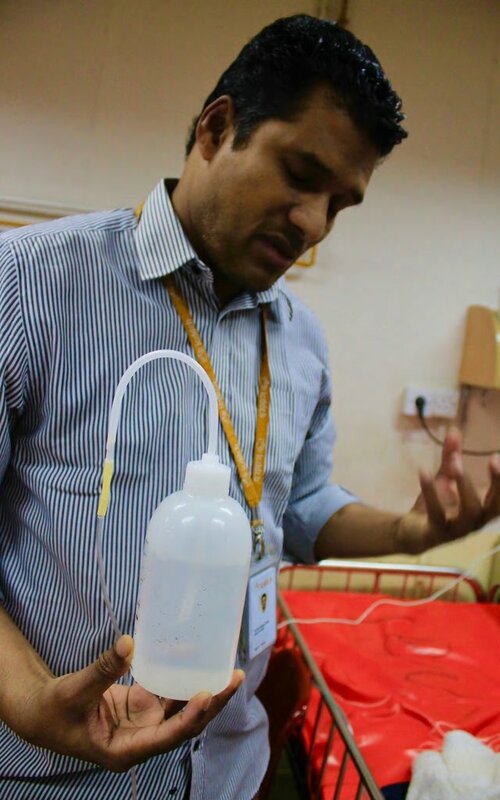 One Bangladeshi doctor, Mohamad Jobayer Chisti – from the Bangladesh research organisation icddr,b – has invented a low-cost bubble-CPAP (continuous positive airway pressure) device for infant pneumonia patients. Originally made from a shampoo bottle, the device replicates the action of a ventilator machine. 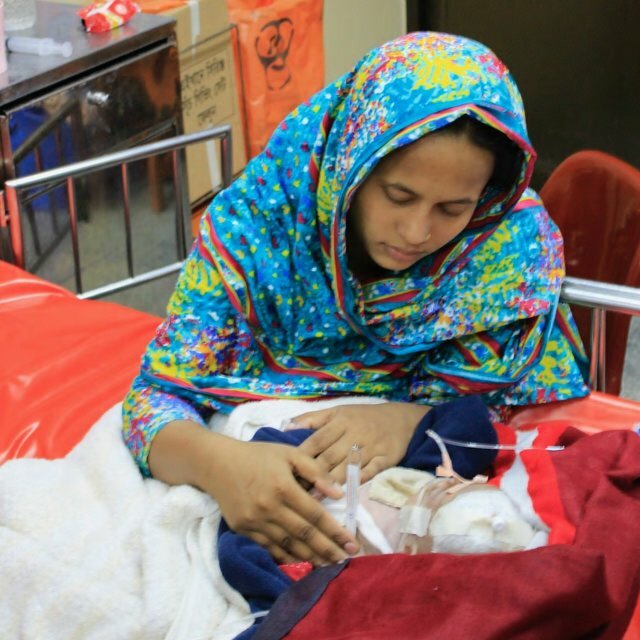 The difference, however, is that Dr Chisti’s device costs less than $2, while a ventilator up to $15,000. Even standard bubble-CPAP devices, normally used for premature babies, cost around $6,000. 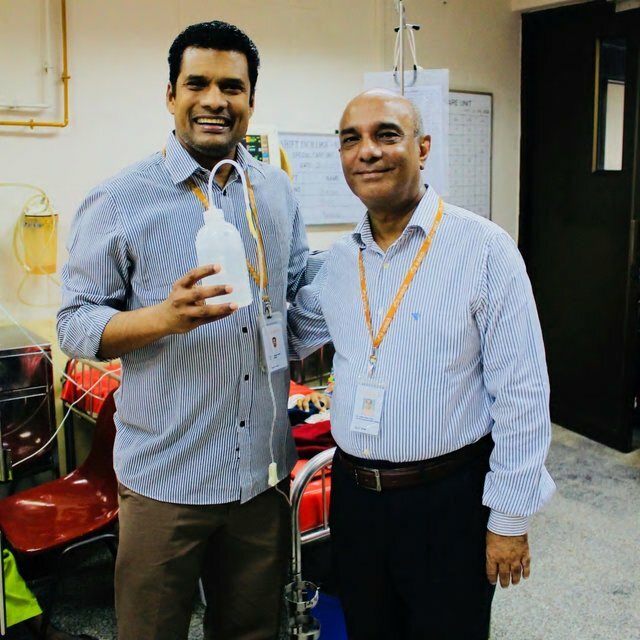 So far, in the iccdr,b hospital, it has proved successful, reducing mortality in cases of pneumonia by 75 per cent and, according to Dr Chisti spending on pneumonia treatment by nearly 90 per cent, from $30,000 in to just $6,000 a year. Now, it is being trialled in Ethiopia. Other innovations are seeking to improve diagnostic tools. In low-income settings, the World Health Organization recommends healthcare professionals assess the child’s respiratory rate (RR) to check for fast breathing associated with pneumonia. 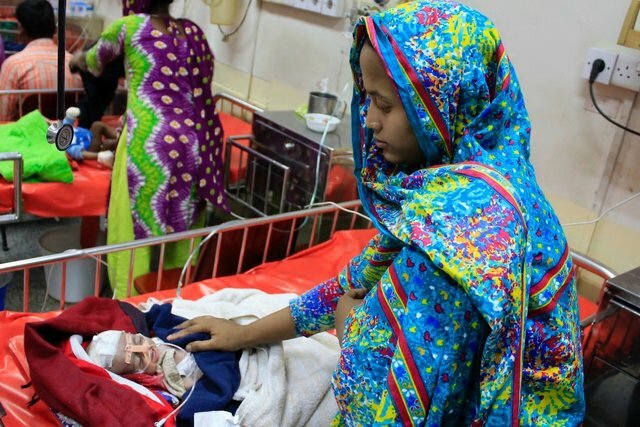 Many health workers use an Ari Timer for this: a device invented 20 years ago that works like a stop watch, measuring 60 seconds while the health worker manually count’s the child inhalations. According to research by UNICEF, it has only a 33 per cent accuracy rate. Working with the Malaria Consortium, UNICEF is trialling a new automated RR device. Known as the ARIDA project (Acute Respiratory Infection Diagnostic Aid), rather than relying on the health worker to count breaths, the relatively simple device is strapped to the child’s stomach and automatically count breaths. So far, having undergone trials in Ethiopia and Nepal, the ARIDA device not only more accurately detects faster breathing but speeds up the time it takes to make a diagnosis. The solution, he believes, is increased investment in prevention, diagnostics and treatment for pneumonia, but more than this an integrated approach to the major infectious diseases is needed. “Malaria progress is stagnating: my plea is that we tackle these together,” he said.